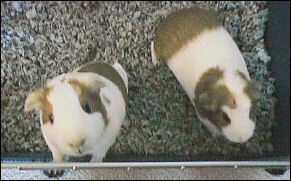 Yep, the guinea pigs' bday is in a couple of days, the fifteenth to be precise, and they have gotten an early present. A new home, yay! 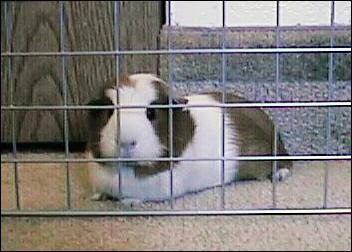 Their old home is small... really meant for a single gp who gets lots of floor time. Tegan and Tess never complained about it, and they never fight, so the small house hasn't been a problem. But the bottom is starting to rust out, so onward and upward, bigger and better! 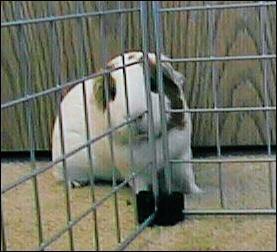 When I ran into Cavy Cages made out of storage cubes and Coroplast (a sheet of plastic that looks like corogated cardboard), I knew that's exactly what the piggies wanted. I finally got the material together, thanks to my Significant Other, and put the thing together this afternoon. It took a couple hours to get the plastic bottom cut down and scored to make the sides. And then almost a whole package of CareFresh, ack.